This step is only required for Deployment Systems with IBM i build environment. The Remote Deployment System is installed and at the same LANSA version and EPC level as the Visual LANSA on Windows installation. The corresponding partition is defined on the deployment system and matches the local partition's definition. TCP/IP is set up and active so that the workstation can access the remote system. You have a login to connect to the remote system and use the target LANSA installation. Note - The partition RDML/RDMLX setting, Job CCSID and default language MUST match or the Refresh from the Remote System will fail. Other partition settings, such as available field types, should match, otherwise unpredictable results may occur when using the Deliver To command. 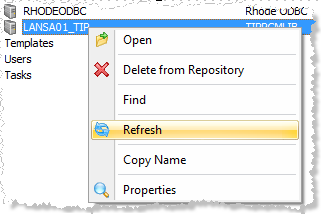 An IBM i Refresh can be performed when creating the Remote System definition or by right clicking on the Remote System in the Repository tab and choosing Refresh. If the User and password differs from the current user in Visual LANSA you must provide the user and password to connect to the remote system.